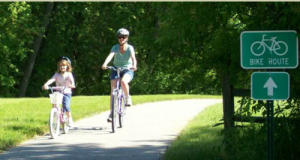 The Forest City Parks and Recreation Department continually strives to maintain, improve, and expand the trail system, in order to reach and better serve the growing residents and visitors. The local trails are a combination of off road paved trails and share the road trails that are clearly marked. Hynes Spur Trail – Approx. 2 miles from J Street at Pammel Park to 330th Street. Meanders through Pammel Park, woodland setting, through the golf course and past the Winnebago Rally grounds to 330th Street. All off road paved trail. Hanson Trail – Approx 9 miles. Begins at on J Street next to Pammel Park entrance, left on Golf Course Road to Hwy 9, East along Hwy 9 to 206th Ave. to Pilot Knob Entrance, West on 340th Street to Golf Course Road and Left on J Street to Pammel Park entrance. 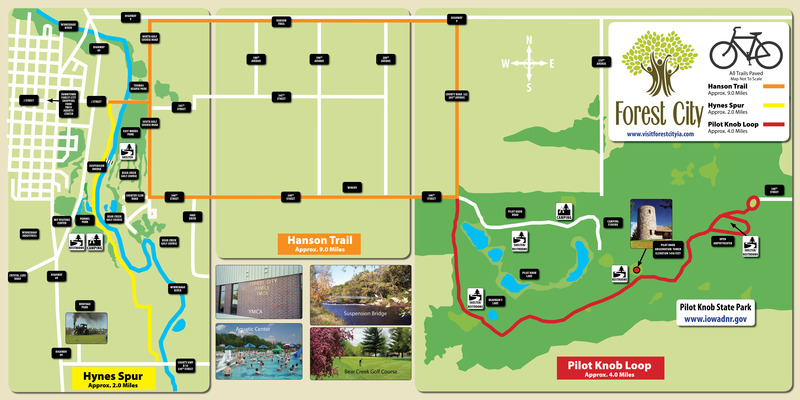 A combination of paved off road trails and on road trails.